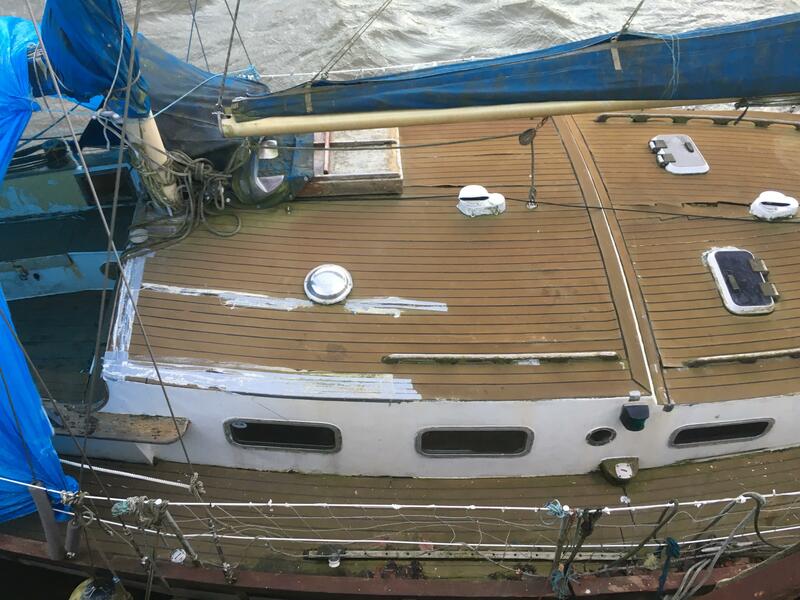 The Hull is constructed from Ferro cement stiffened with steel reinforced Ferro frames & floors. 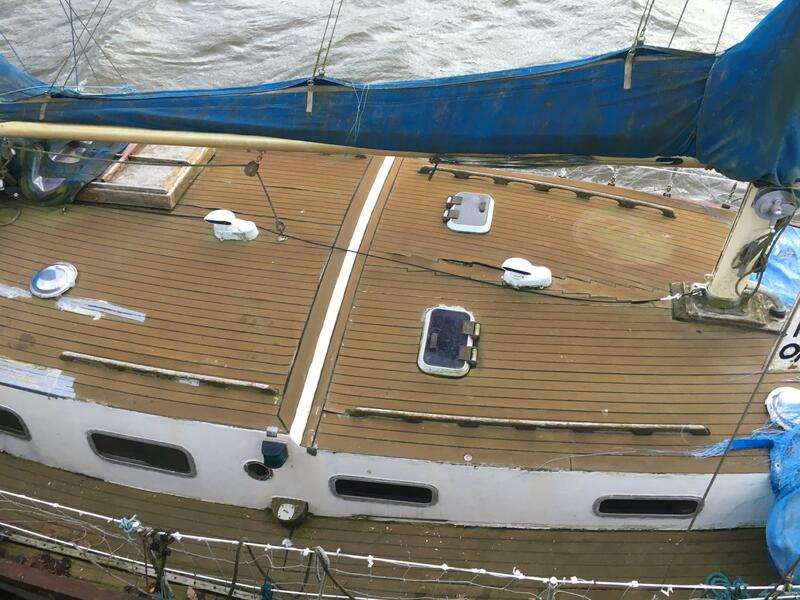 Hull is painted white with a blue boot topping. 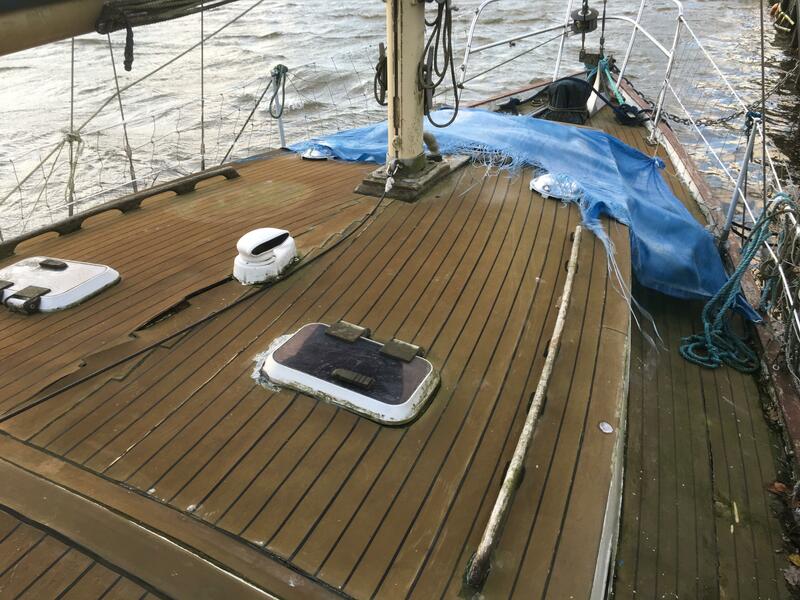 The Decks are constructed from Ferro with the cabin sides and roof of glass sheathed plywood with the roof laid on laminated hardwood deck beams the deck and cabin roof is covered with Tek Deck which is in need attention in some places. 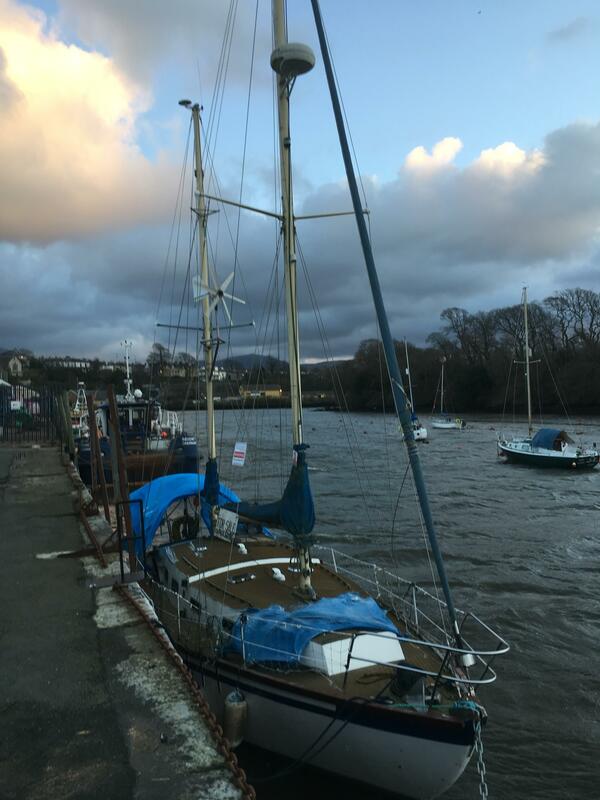 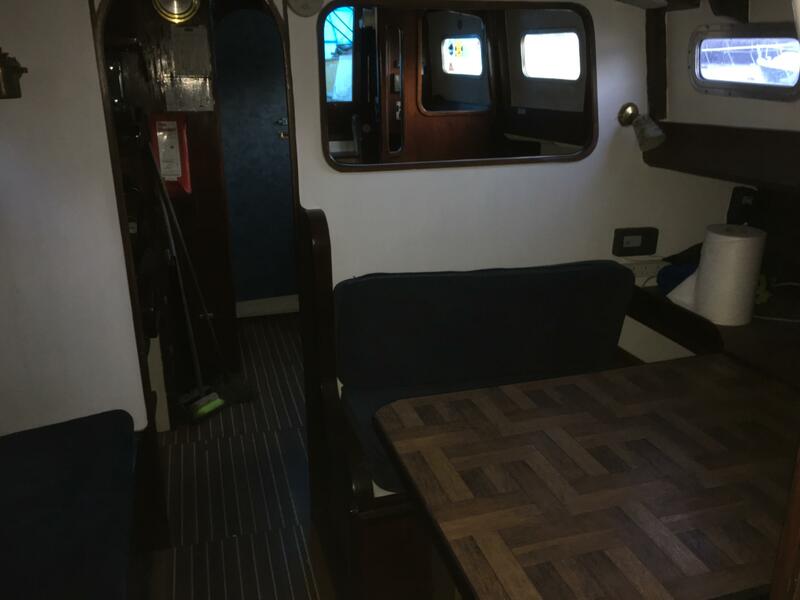 Fitted with a BMC 1.5 marinised diesel which drives a hydraulic pump which is connected to a hydraulic motor which drives the stern gear. 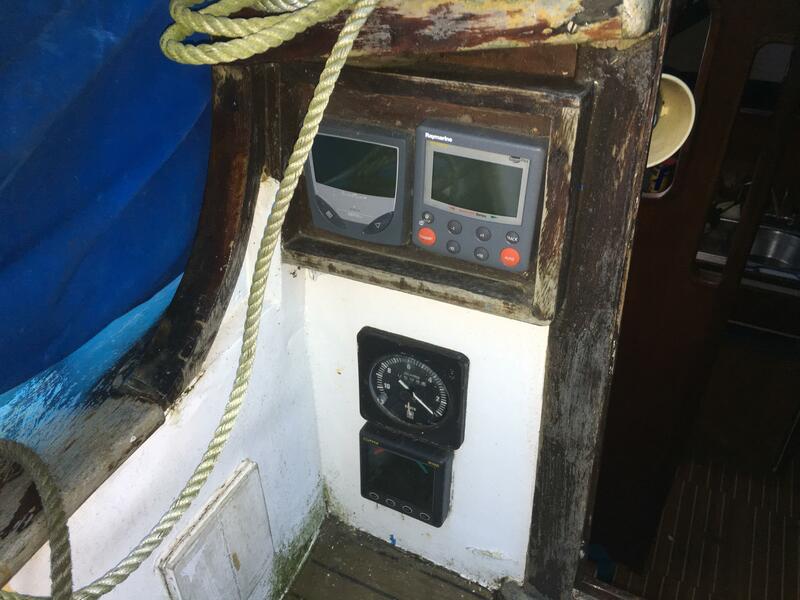 Twin leaver remote controls are fitted in the cockpit. 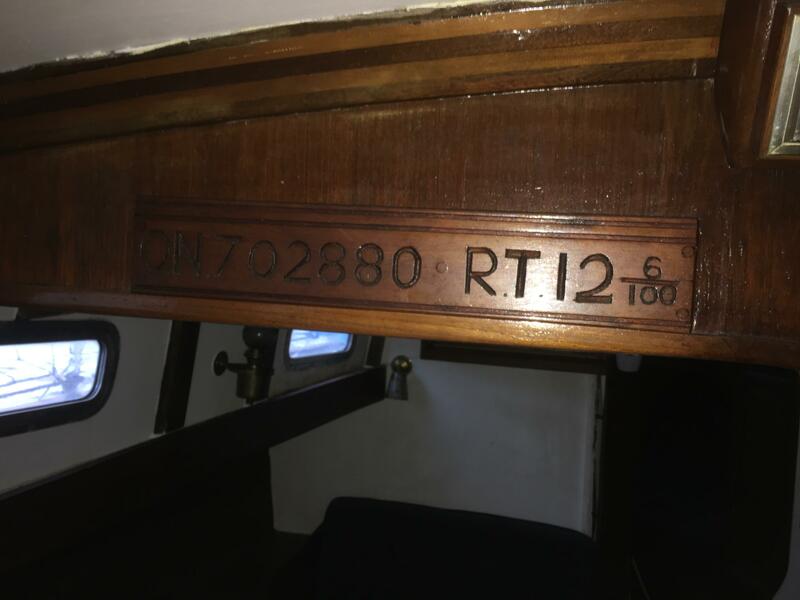 ( it is understood that this engine was reconditioned in 2002). 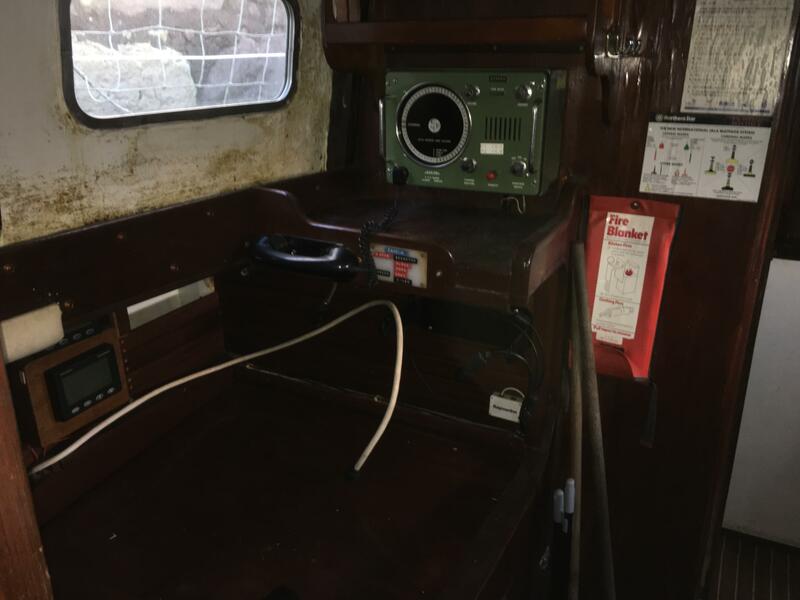 The 12v system is supplied from 3 batteries alternator charged. 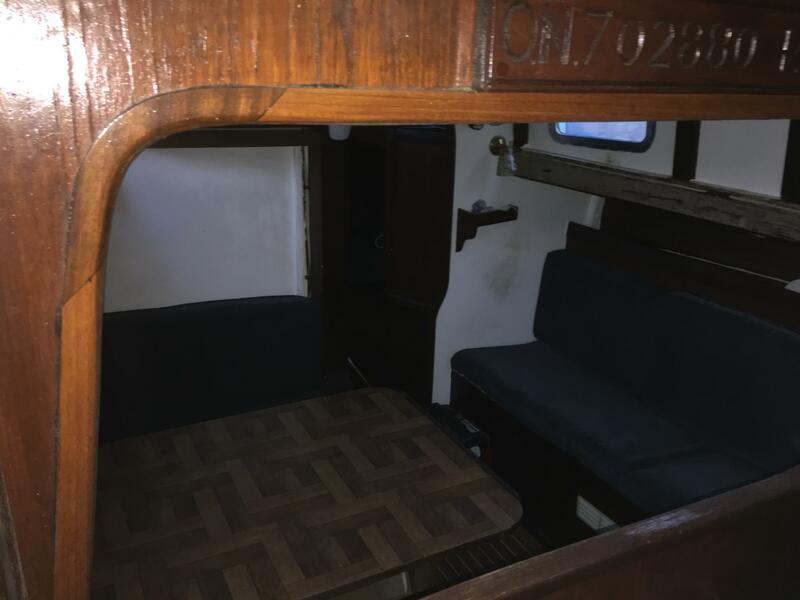 Steel Fuel tank is located beneath the cabin sole with 2 x fresh water tanks one flexible under saloon sole with a built in tank under the galley. 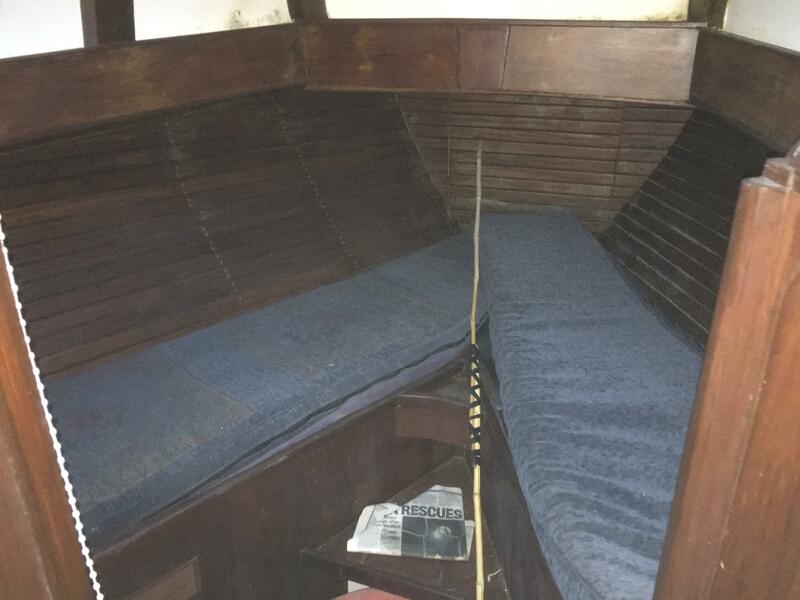 Aluminium alloy mast and spars consisting of a main & mizzen. 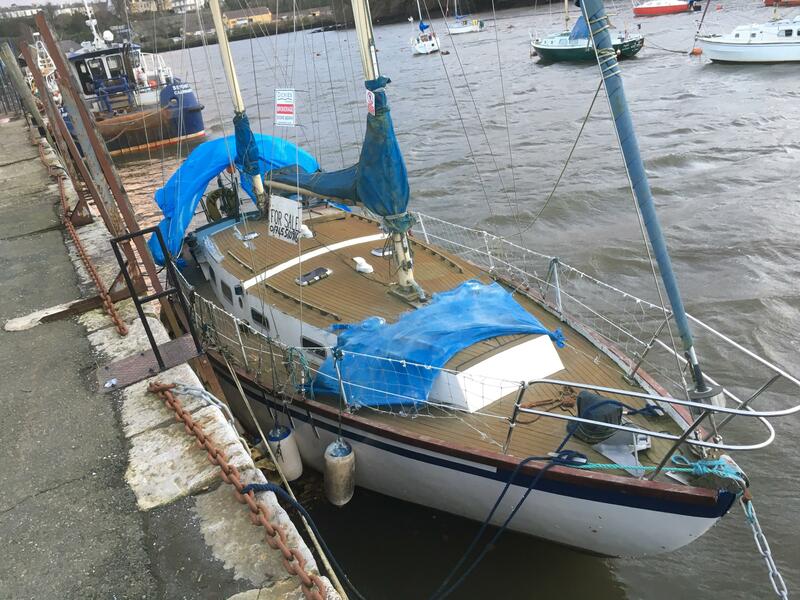 A Rotostay E Furling system is fitted at the forestay. 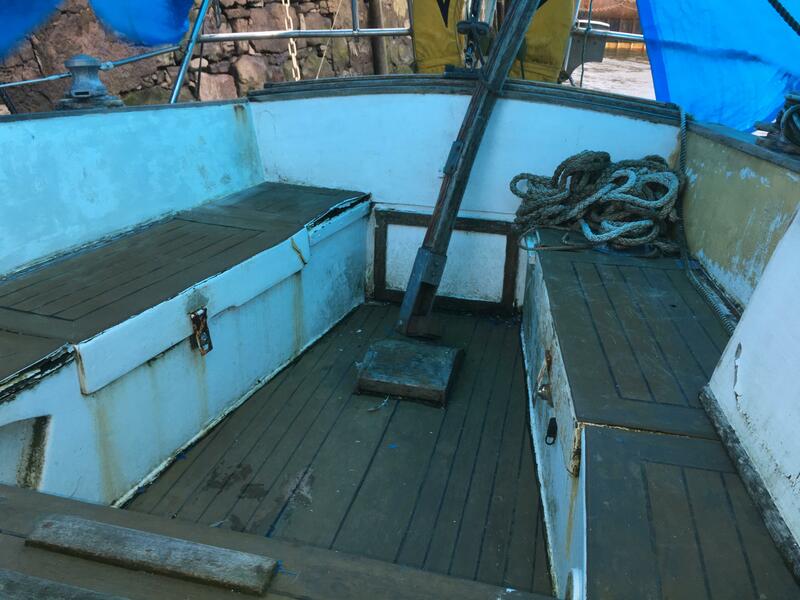 The mast is deck stepped. 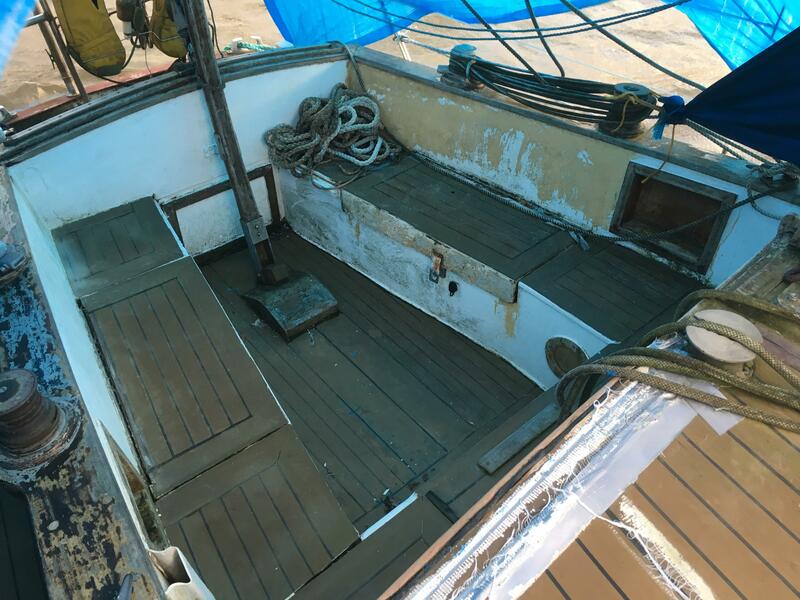 It is understood that the standing rigging was replaced in July 2005 with new rigging screws in 1999. 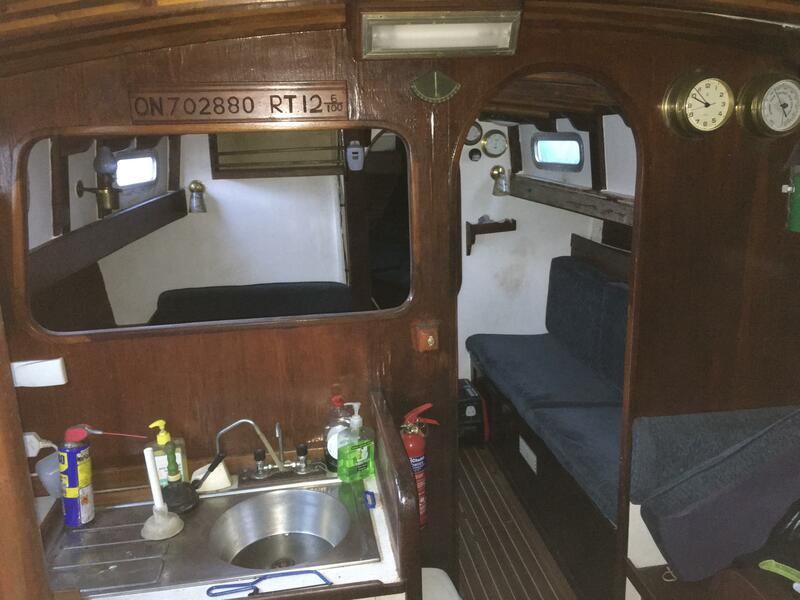 The Accommodation consists of a V berth forward with storage below. 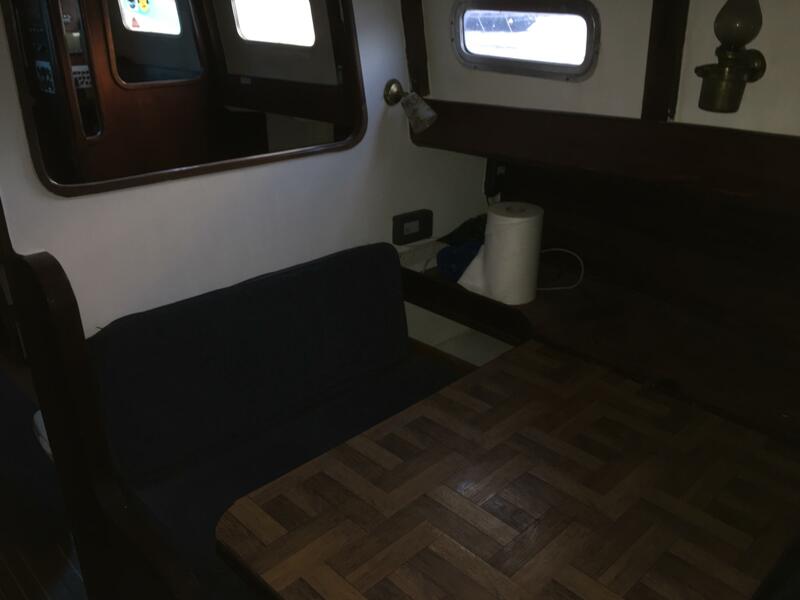 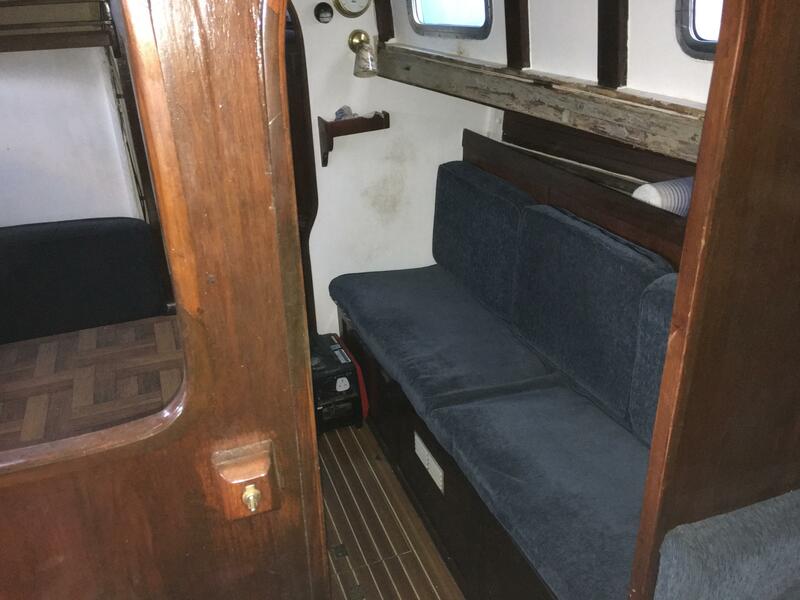 Moving aft into the main saloon you have a large table offset to the port side with surround seating with a single berth opposite. 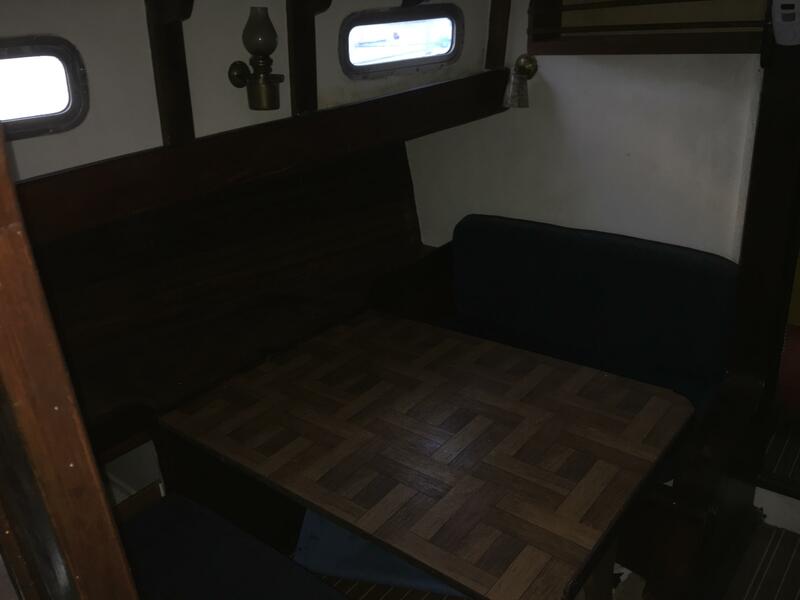 The table drops to form a double berth to port. 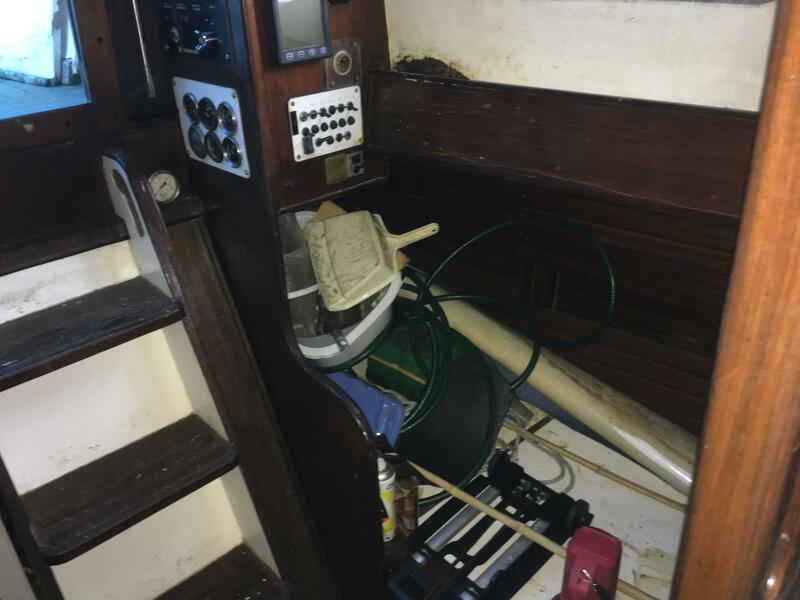 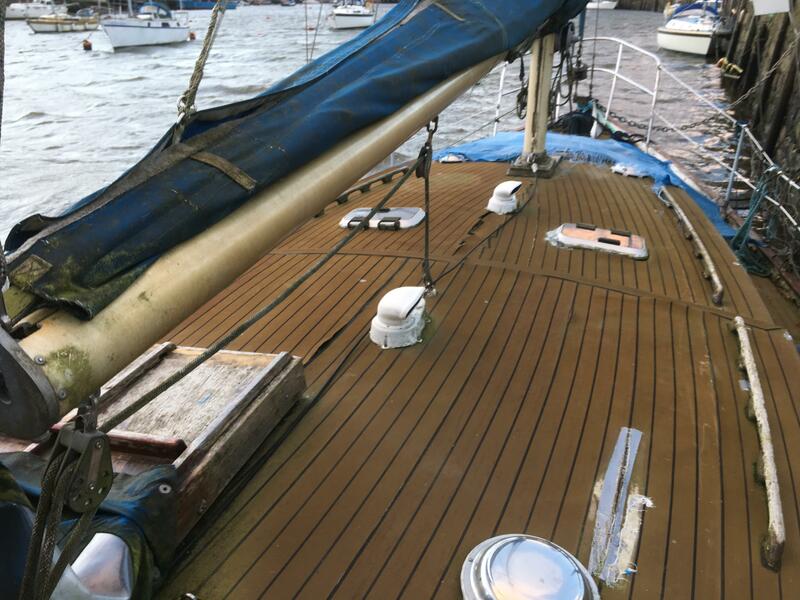 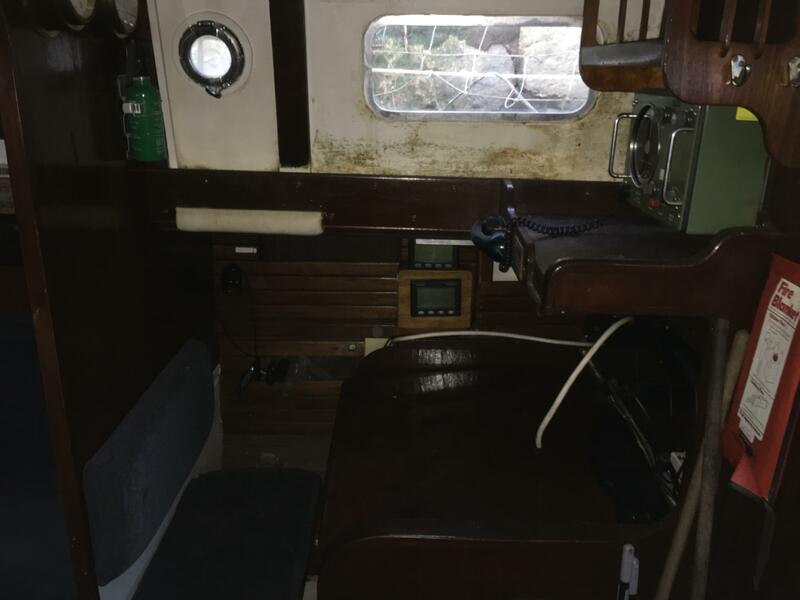 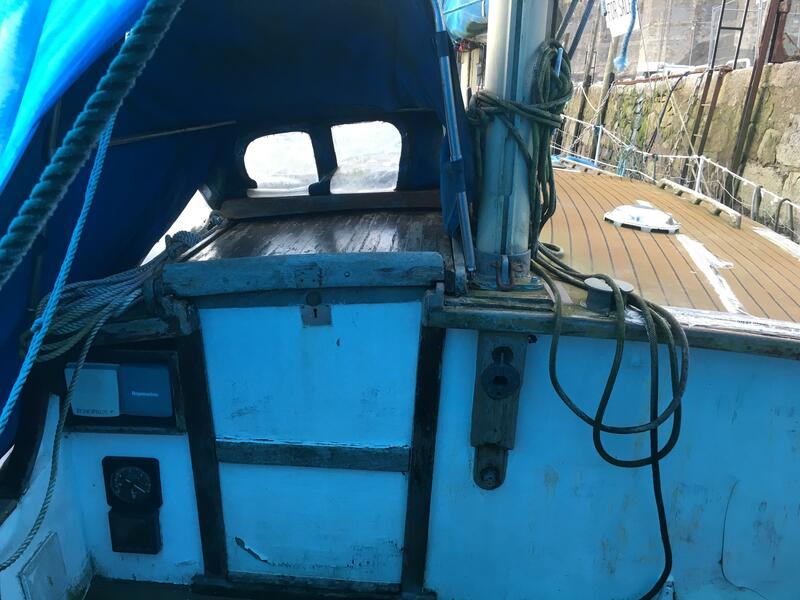 The saloon is broken up with a open toped bulkhead with U shaped Galley to port and a chart table to starboard. 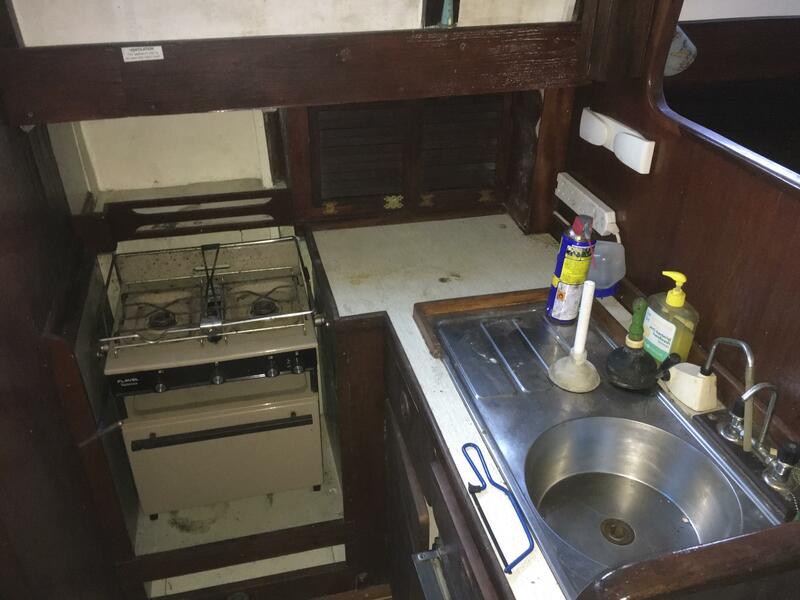 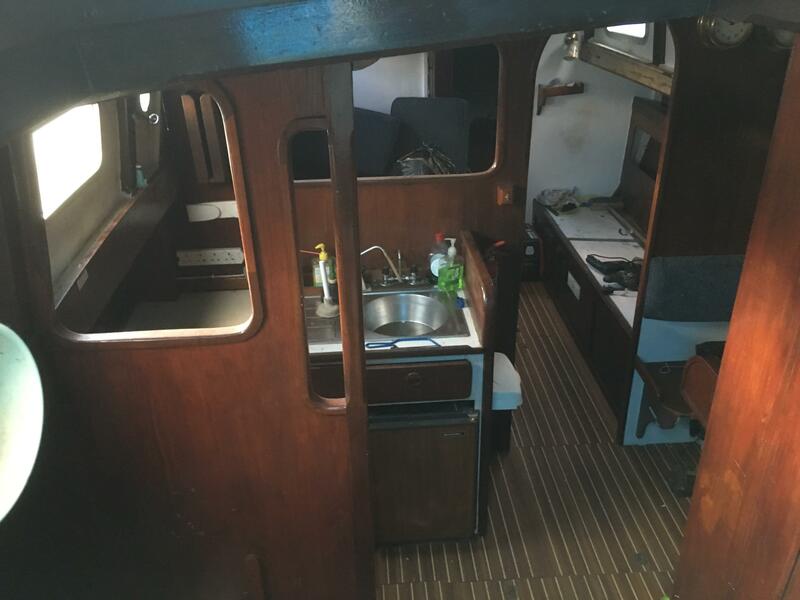 Galley consist of sink, fridge, cooker and storage. 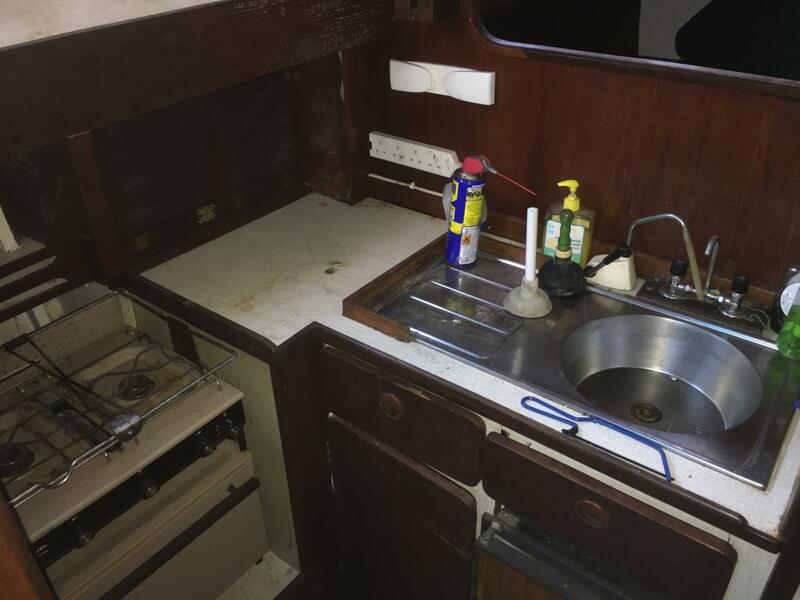 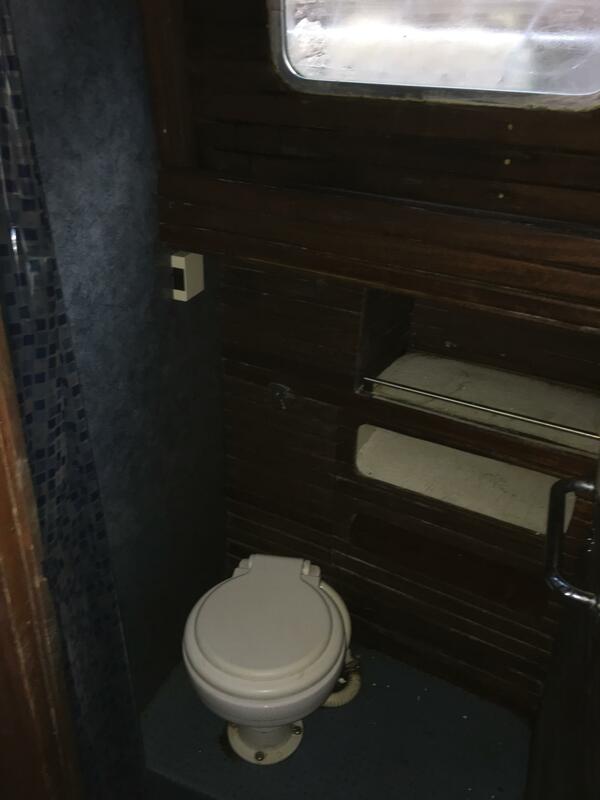 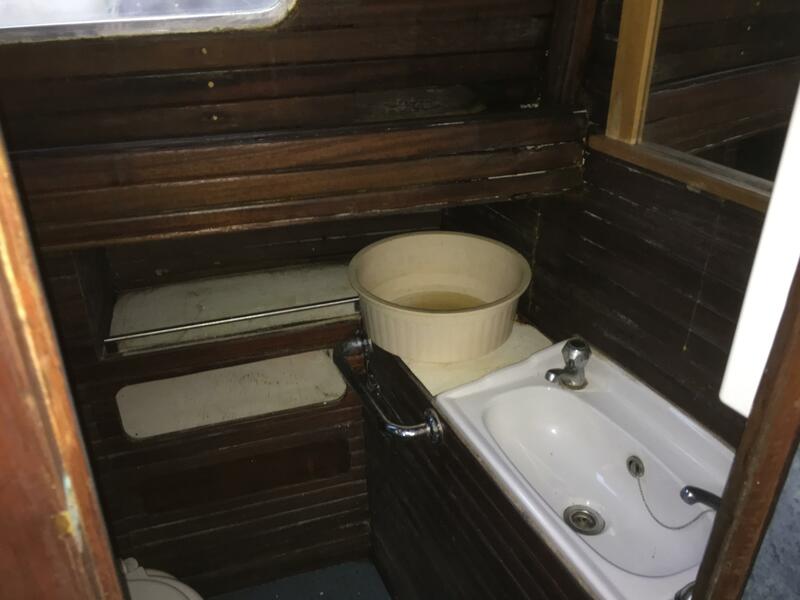 Aft of the Galley can be found a generous quarter berth and opposite an enclosed heads and shower. 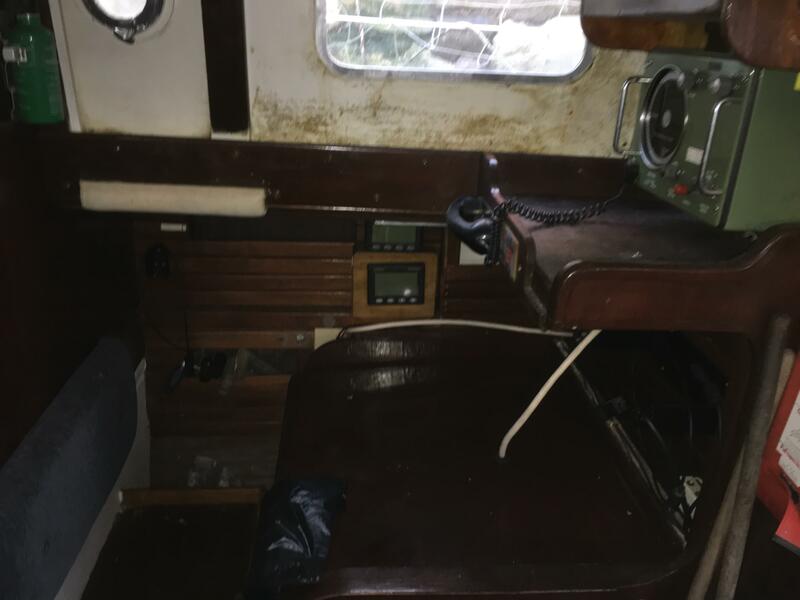 Cockpit wood is in need of attention, hence the asking price.